Easy base granola recipe that can be tweaked to fit your preferences with dried fruit, nuts, and even chocolate. To some people, granola is one of those classic hippy dippy foods that only the most obsessive of health nuts consume, but if you can just humor me on this one and give it another try I can pretty much guarantee you won’t regret it. Yup, guarantee. That’s how confident I am that you granola haters should ease on over to the oat lovin’ side. Take it from me, its a good side to be on. Full of heart healthiness and whatnot. And this granola recipe is about as foolproof as they come. Toss a little honey (or agave) and coconut oil together with a few spices, stir in the oats and pop the pan in the oven. You’re going to have to pull the pan back out for a few stirs and to add in the almonds, but we’re not making beef bourguignon here folks, this is easy stuff. 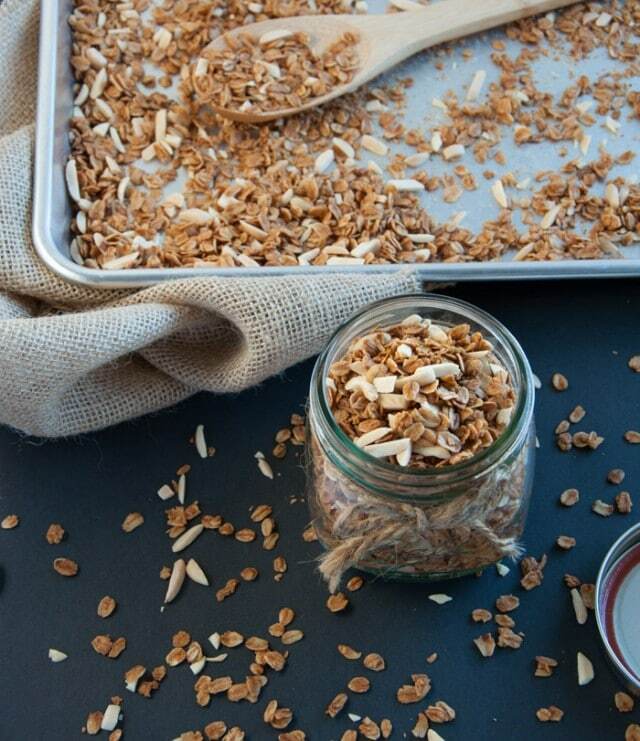 I fit the entire granola recipe onto a half bakers sheet but spreading the oat concoction out on a larger pan would help it roast more evenly. Either way, its pretty forgiving. Store bought granola is typically loaded with preservatives, unnecessarily high levels of refined sugar, and GMO laden vegetable oil. Don’t get me wrong, granola is NOT supposed to be a low calorie food by any means. Its purpose is to give you energy, which takes calories to do. You can have a healthy, filling snack though without a bunch of processed junk in it. With the way the East Coast is getting hammered with snow lately, I feel a little guilty getting 60 degree days over here in the Pacific NW. Guilty or not, this weather has been fan-freakin-tastic over here in our neck of the woods. Over the weekend, we did sooo many outdoor activities and I realized how much I’ve missed the outdoors. Between go-cart racing, hiking by waterfalls, and a long leisurely walk with my fav little pug mut, it has been a pretty relaxing last few days. Even the food I’ve been making has been easy and effortless. 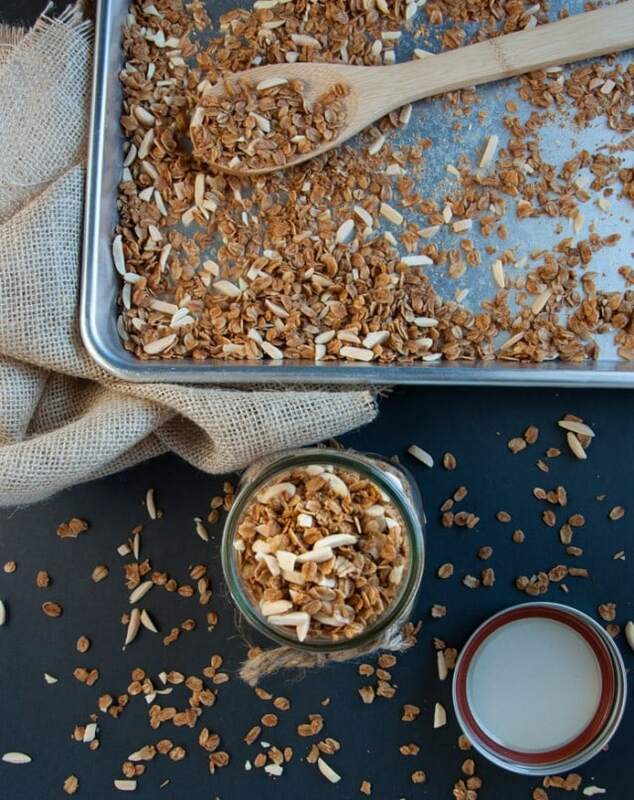 This granola recipe is as simple as it gets and everything else I’ve made has just been random and thrown together. Sometimes I like the more involved recipes, but lately, I’m really digging spending that extra time with family and friends. You’ve gotta kick back when you can, ya know? Just a day and a half after making this granola, we’ve blown through the whole batch so round two is on the horizon. I prefer it as is so that I can add in dried fruit and other nuts when I feel like it, but I think coconut would be a lovely addition to the base recipe. Mmm, maybe shredded coconut and coconut extract with a sprinkle of chocolate chips? The possibilities are truly endless. If you come up with a concoction you love, please share it with the rest of us in the comments section. Share the granola love! Preheat to 300 degrees F.
Thoroughly mix vanilla, salt, cinnamon, and honey into melted coconut oil. Add oats and stir to evenly coat with the liquid mixture. Spread oats out over a baking sheet and bake for 15 mins. Remove from oven, add almonds and stir mixture. Bake for another 15 minutes then remove, stir, and bake for another 15 minutes. Remove from oven, stir, and let sit to cool before storing in an airtight container for up to two weeks. small changes that make the biggest changes. Thanks a lot for sharing! You get me!! 😉 A series of small changes can add up to HUGE change over time. Such a simple concept but so easy to forget when we get swamped in the every day craziness that we call life. Cheers to making micro changes Tammi! You’re right! Super easy! I couldn’t stop nibbling it while it was cooling. I added 1/2 cup shredded coconut and it worked well. I think this is my new breakfast staple. Thanks!